I've been talking with Rachael about this book since it went by another working title and can't wait to get my hands on a copy! Rest assured, when I do, I'll be filling you in. 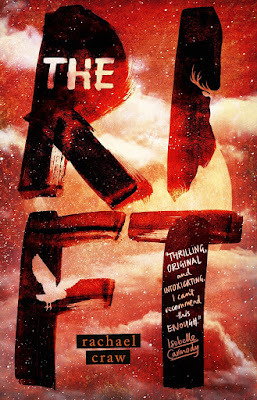 The Rift is officially out in November and promises a brand-new mystery featuring an ancient curse and a centuries-old secret. The story is set on Black Water Island, where terrifying creatures slip through a dimensional Rift every full moon. These creatures hunt the Old Herd, an ancient race of deer whose antlers carry a potent healing compound, Actaeon’s Bane. The Rangers of the Island have protected the Herd for millennia and face a new threat from a ruthless corporation, Nutris Pharmaceuticals, who will stop at nothing to acquire the compound. The heroine? Meg Archer. A love interest? There sure is one, and an island to save. In addition to her cover-stamp or approval, best-selling author Isobelle Carmody says "the romance between Cal and Meg blends envy, desire and uncertainty with a potent authenticity."